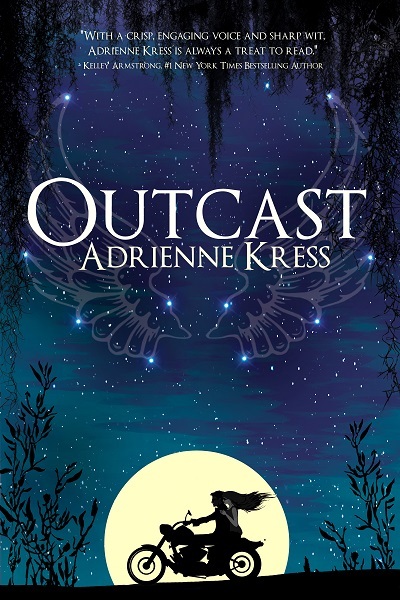 Today’s review is part of the blog tour for Adrienne Kress’ new book, Outcast. 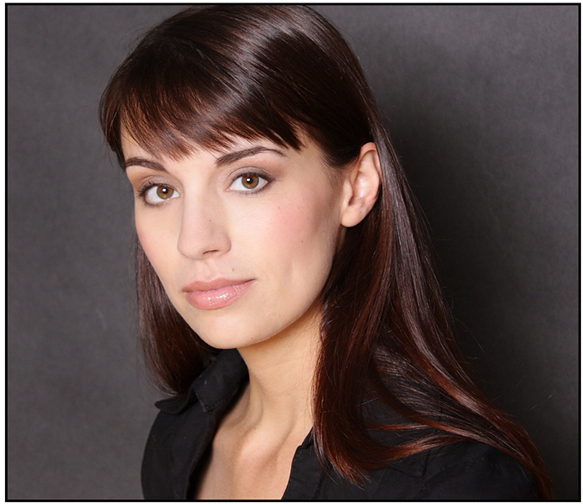 It’s a paranormal romance with a vintage vibe and a gun-toting heroine (with attitude). We all know (or suspect) how much a pretty cover can influence us to pick up a book. This is me, admitting to giving this book a chance because of its cover. What can I say? It’s so SHINY! *ahem* Back to business. Often, authors don’t have anything to do with their book covers, but in this case, Adrienne Kress helped create the beautiful artwork for Outcast, and I think you must agree with me that she’s one talented human being. After all, she wrote a funny paranormal romance, AND designed its cover. Riley Carver has spent the last year mourning her best friend, who was ‘taken’ by the angels only a week after they’d shared their first kiss. Now, on the anniversary of his disappearance, she’s mad instead of sad. When she sees an angel, she lets the anger take over and shoots it. In the face. If only that were the end of things! Somehow the angel has turned into an unconscious naked guy. When he wakes and believes he’s from the 1950s, Riley has to decide who to trust, what to do with a town of angel-obsessed people, and how to survive this year in high school. It’ll be quite an experience. I’ll just put this out there: I’ve been burned by the angels-as-paranormal-heroes thing before. But when I read the first few pages of Adrienne Kress’ new book, I knew that I’d found a different kind of story. For one thing, heroine Riley Carver is a quirky badass. After all, she shoots angels (well, just the one, really). After that, there’s really no telling what will happen next, because things just get more and more unlikely. In a really interesting way, of course. As a character, Riley is a hoot. She’s introspective, feels like an outsider, is dealing with losing her best friend, and trying to figure out what to do with a lot of mysterious occurrences and a guy who she may or may not be able to trust. Oh, and small town life. Riley’s adventures and misadventures reminded me a bit of Nancy Drew, although her inner dialogue was a lot more sassy and hilarious than I remember that other teenage sleuth being. Gabe, the ‘angel’ is a James Dean lookalike with a chip on his shoulder and over fifty years of history to catch up on – but it’s pretty clear he thinks Riley is fantastic. His only ‘con’ would be a propensity to always address Riley as either sweetheart or dollface. That gets old pretty quickly. His and Riley’s friendship (once they develop a level of trust) is one of discovery and fast-paced banter. It’s light and enjoyable reading. However, my favorite character aside from Riley is cheerleader Lacy. She’s not a cardboard secondary character – in fact, I think her story (only hinted at) is probably just as interesting as Riley’s in its own way. As for the plot, it follows Riley and her adventures in Hartwich over the course of a year, and there’s a lot of growing up mixed in with the occasional moments of fear, paranormal activity and high school politics. It makes for an unusual blend, but it works for the most part. My two small quibbles with the story have to do with the fair amount of exposition (rather than action) that it takes to describe what is actually going on in this sleepy Southern town, and one of the late-in-the-story reveals. The strongest part of Outcast is definitely Riley, but Kress also writes dialogue with humor and feeling. The awkward conversations felt awkward. Riley’s interactions with her parents were spot-on. And the swoony bits were very good indeed. In addition, Kress’ unique take on angel mythology was pretty fascinating. In all, this is an entertaining light paranormal romance with some interesting twists and a fantastic heroine. Recommended for: fans of Gina D’Amico’s Croak, those who like light romances with a paranormal twist, and anyone looking for hilarious dialogue as a main element in their YA reading. Her debut YA, The Friday Society (Penguin), was released in the fall of 2012 to a starred review from Quill and Quire. And her quirky romantic YA, Outcast (Diversion Books), is out this June. AND… if you’ve made it this far, please do enter the giveaway! One entrant will receive an e-copy of Outcast. To enter, simply fill out the FORM. Giveaway open internationally, will end on June 24th at 11:59pm EST. Winner will be selected randomly and notified via email. Good luck! Fine print: I received an ebook of Outcast for honest review from Diversion Books. Giveaway prize will be provided by the publisher. I did not receive any compensation for this blog tour post. Ooooooooooooooo I love love love the cover and it sounds gooood. Please count me in!! I have this one in my TBR and now I really can't wait to read it. Liviania: OUTCAST isn't without its faults, but in general Riley's point-of-view smoothed over the rough patches. And there were some really funny bits/stretches of great description. So: hope you enjoy!